Hitch. Photo by Richard Macedo, California Department of Fish and Game. Hitch adult. Photo courtesy of Professor Peter B. Moyle. Clear Lake hitch. Photo by Ed Legan. April 30, 2015. Hitch are most often found in slow warm water, including lakes and quiet stretches of rivers. Hitch are sometimes found in cool and clear, low-gradient streams, hiding among aquatic vegetation in sandy runs or pools. They are the most heat tolerant of the native Central Valley fishes and can withstand water temperatures greater than 30°C under some conditions. 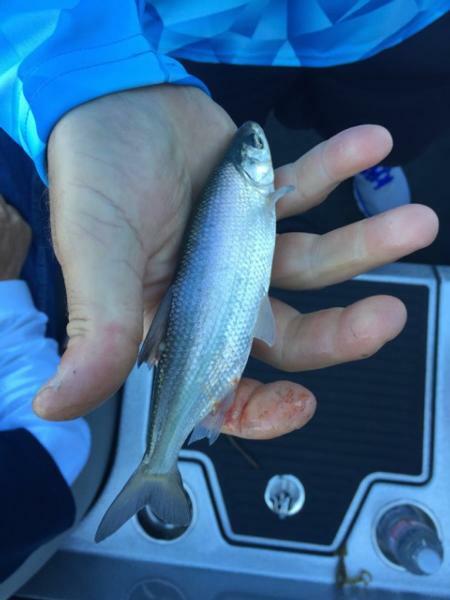 They have also been found living in brackish water with salinities as high as 9 ppt. 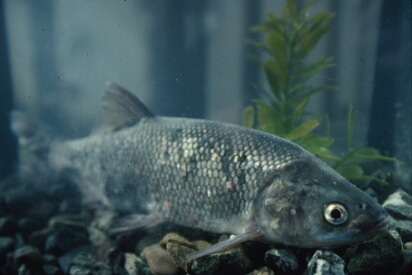 Within a pristine system Hitch often share habitat with Sacramento Blackfish, Sacramento Suckers, and Sacramento Pikeminnows. In altered systems Hitch are found among introduced species like Mosquitofish, catfish, and centrarchids. In a stream the Hitch may use its upturned mouth to feed in the water column or to feed on the surface for insects. In a lake Hitch may occupy different spaces depending upon age. Juveniles typically live in shallow vegetated areas near shore, while the older fish (>80 days) live in deeper offshore waters. Young Hitch may shoal for the first two months of residency in a lake. The diet of a limnetic (lake-dwelling) Hitch may include zooplankton, crustaceans, or various forms of insects. Growth rates of Hitch vary depending upon the environmental conditions, though in general females reach sexual maturity in 2-3 years, while males may reach sexual maturity in years 1-3. 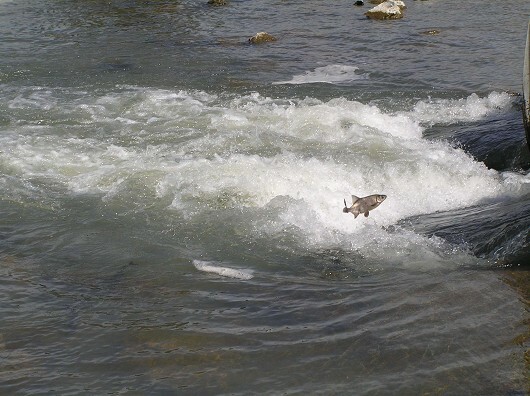 Spawning typically happens in the tributaries to lakes and rivers, and may begin as early as February and end as late as July. Fecundity in Hitch is relatively high as one female may produce 3,000 to 63,000 eggs, depending upon body size. When spawning adults reach a suitable riffle for breeding one female may be surrounded by 1-5 males. A ripe female releases her eggs into the current and the males immediately fertilize the eggs. The eggs then settle into the gravel substrate where the size of the ova will increase and help lodge it into the rock particles. In 3-7 days the embryos hatch, and 3-4 days after the hatch the embryos begin to swim freely. 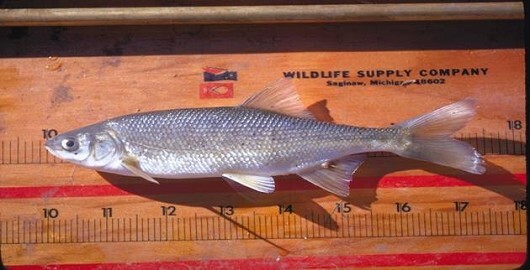 The young Hitch may swim downstream to a lake or slough, or reside within the stream under the cover of aquatic plants. Hitch generally live for a total of 4-6 years. Hitch jumping at Bell Hill Road Crossing on Adobe Creek (Clear Lake, CA) on 4/21/2006. Photo by Richard Macedo, California Department of Fish and Game. 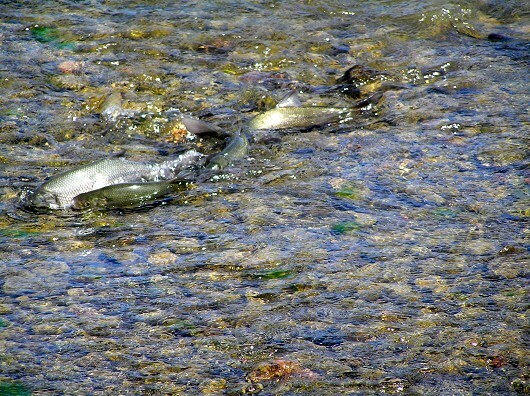 Hitch spawning at Bell Hill Road Crossing on Adobe Creek (Clear Lake, CA) on 4/21/2006. Photo by Richard Macedo, California Department of Fish and Game. Hitch (Clear Lake hitch) spawning in Kelsey Creek, a tributary of Clear Lake. Filmed 03/26/08 by Lisa Thompson. Thanks to Peter Windrem (Chi Council for the Clear Lake Hitch) for showing me the fish! Hitch (Clear Lake hitch) spawning in Kelsey Creek, a tributary of Clear Lake. Single fish swimming along shore. Filmed 03/26/08 by Lisa Thompson. Thanks to Peter Windrem (Chi Council for the Clear Lake Hitch) for showing me the fish!